This is the first Guest Blog entry, because I couldn't have written it without Thomas's help, without his pictures, and his information needs no editing. When the new software for the Stampex kiosks was programmed, kiosk no. A005 was set up first. The default was Union Flag on reel A and Machin on reel B. The default text imprint for the Machins was „Stampex Spring / 19 – 22 February“. And the receipts would have the imprint „Union Flag“ and „Machin“ accordingly. Another default was that the receipts for the 1st Class strip of 6 have the value of 0.60 instead of £3.60. This default software was then adapted and copied to kiosks A003 and A004. On the afternoon of the 1st day of Stampex [19 February] kiosk A005 fell back to the default settings after a malfunction and subsequent software upload. The kiosk was loaded with Union Flag on reel A and Machin (MA13) on reel B. The default settings resulted in Machins with wrong text „Stampex Spring“ and receipts (for both) for 1st Class strips with a value of 0.60 GBP. Much more interesting is the same error on kiosk A003. Also on the first day of Stampex this kiosk was reset after malfunction. This kiosk was loaded with flowers on reel A and Machins (NO YEAR CODE) on reel B. When the kiosk fell back to default settings, it printed id-number A0005 on all stamps and receipts! This is how Spring Flower stamps occured with number A0005. The Machins on reel B had the same wrong text „Stampex Spring“ (4 collector-sets Machins „Stampex Spring“ without year code are known). 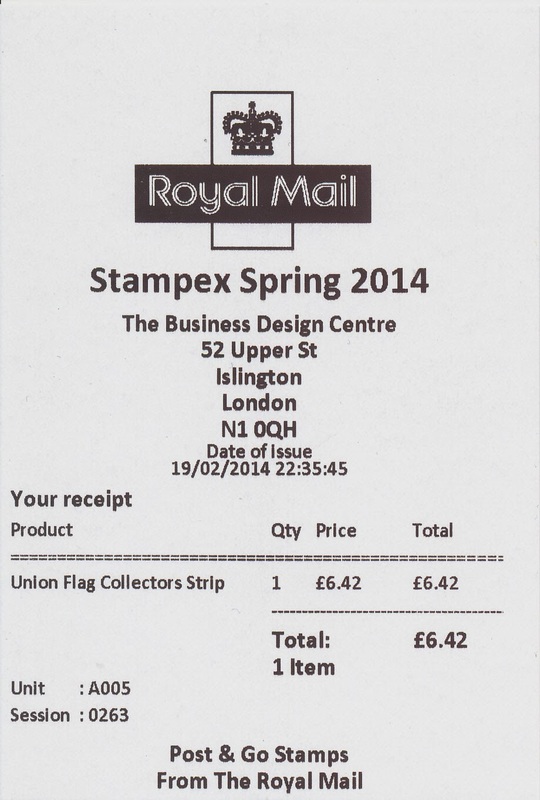 The receipts for the Spring Flowers indicate Union Flag, of course, and the strips of 1st Class do have the wrong value 0.60 GBP, again. The error on kiosk A003 was fixed very quickly and so far transaction no. 262-263 are known, only. do you know if the Worldwide upto 10g will still be valid after the 31st March 2014?